The Prime Minister’s proposals on the rights of EU citizens living in the UK after Brexit is reported in the Telegraph, Guardian, Financial Times, Independent, Mail, Sun, Mirror and Metro. It is also running on broadcast channels as one of the top stories this morning. The papers say that the Prime Minister told European leaders yesterday that EU citizens who have lived lawfully in the UK for five years will be entitled to claim a new "settled status". The Department for Exiting the European Union will be publishing more details of the UK's negotiating position on the rights of EU citizens in the UK and UK citizens living in Europe on Monday. 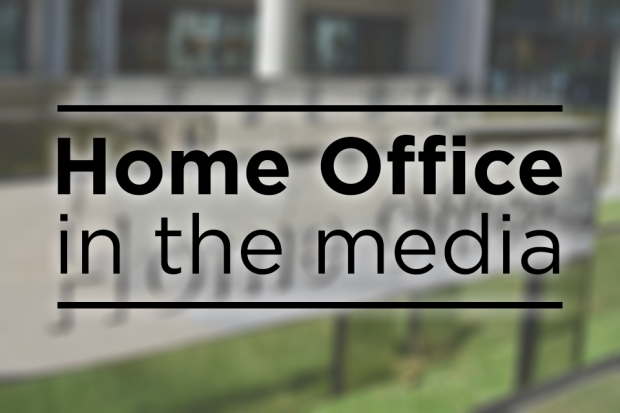 Comments by Dave Thompson, chief constable of West Midlands Police and the finance lead for the NPCC, have been reported in the Times and on BBC and Sky News this morning. He has said that police in England and Wales would struggle to deal with riots on the scale of those in August 2011 because of pressures he says police forces are facing following the recent terror attacks and the Grenfell Tower fire. Speaking on the Today programme, he called for a discussion with the Government on the future of police funding. The Home Office response to his comments is below. Police officers across the country do a uniquely challenging and absolutely vital job keeping us safe and secure. Police funding has been protected since the Spending Review in 2015 and we will continue to ensure police forces have the resources they need to reduce crime and protect the public. Alongside this, we remain committed to increasing cross-government spending on counter-terrorism by 30 per cent - from £11.7 billion to £15.1 billion.